Posts may be sparse this week and one challenge at a time. I'm in the grips of general living, refrig going out, back to school hamburger-hot dog bash this weekend, whew! It was feeling a little like fall, cool and rainy, freak of July here in Tx, but now it's Aug. and bang back to 100's! 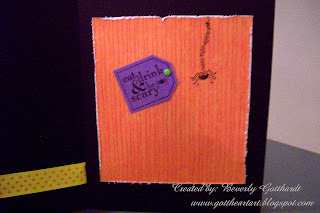 Supplies: Card Blank Black 5"X 61/2" Value Pack Hobby Lobby, patterened paper-Debbie Mum Harvest & Holiday paper pad-Jo-Ann's, Stamp: Stampin Up-Eat, Drink, and Be Scary, Ink: Ranger Archival Ink-Jet Black, ribbon-Hobby Lobby, orange brad-Fall brad pack-Hobby Lobby, black pop dots. 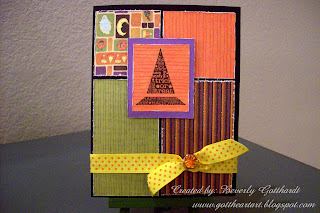 Wow, I lurve this card!!! Fab image!! Thanks for joining us at Charisma - good luck! Great card. I am happy to see a halloween card. It is refreshing. Thanks for joining us at Charisma Cardz. Oh fab card, loving the papers and the style of the image! Thanks for using my Charisma Sketch.